What are UL Listed Locks? UL is an acronym for Underwriters Laboratories Inc. which is an independent product safety certification organizations. UL develops standards by which they test door hardware to verify that it meets certain safety requirements during use, or in the event of a fire or other circumstances. Not all locks are UL listed. In fact, most residential locks are not. For insurance [and other] reasons UL listings are often required in commercial applications. 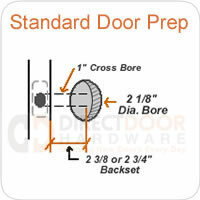 We have assembled all of our door hardware that is UL listed in this category to help you find the correct product for your project.